Soc Trang (VNA) – The Ok Om Bok Festival, also called the Festival of Worshipping the Moon, will take place in the Mekong Delta province of Soc Trang from October 28 to November 3. A string of activities will be held within the festival, including moon worshipping ritual, competition to restore Ca Hau boat and street festival. 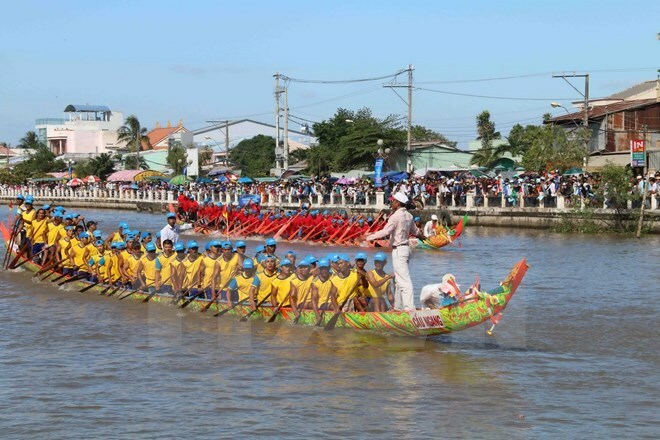 A highlight of the festival will be “Ghe Ngo” (Khmer Boat) race, which has attracted the registration of 58 rowing teams from Soc Trang, Bac Lieu and Ca Mau provinces, said Ly Binh Cang, head of Soc Trang province’s Committee for Ethnic Minority Affairs. The Khmer people consider “Ghe Ngo” race as both a game and a way to express solidarity as well as a traditional ritual to see off the God of Water to the ocean after the growing season. It is a religious ritual of the Khmer to commemorate the Snake God Nagar who once turned into a lump of wood to help the Buddha cross the river. Du Ke, a style of musical theatre created by the Khmer people in the early 1920s, will take stage during the festival. The activity aims to preserve and develop the outstanding art of the Khmer group. In addition, over 200 businesses will showcase their farm produce at 500 pavilions during the festival. Vice Chairman of the provincial People’s Committee Ngo Hung said that the province has carefully been preparing for the festival. With 855 one-three star hotel rooms, Soc Trang can serve up to 1,700 tourists during the festival. In addition, the province has 753 standard hotel rooms which can accommodate 1,500 people. The Ok Om Bok festival is one of the three main festivals along with Sene Dolta and Chol Chnam Thmay that Khmer people celebrate every year. The festival takes place under the full moon in the 10th lunar month annually, when it changes from the rainy season to the dry season, the growing season to the harvest season. Khmer people believe the moon is a God who controls the weather and crops throughout the year. The Ok Om Bok Festival of each village takes place in the gardens of local pagodas, while the whole province’s Ok Om Bok Festival is organised at Ba Om pond.